The Eastern Orthodox Church is one of the oldest Christian denominations in the world that has spread out mainly in the Middle East and Eastern Europe. Basically, the diocese of the world has been established in Constantinople (currently Istanbul).. There is a hierarchical management system, such as Protoiereus, a priest, and a deacon in the independent parish in each country and it is characteristic system that the independent parishes mutually cooperate. For example, there are independent Orthodox churches, such as The Russian Orthodox Church in Russia and The Orthodox Church in Japan and they often interact each other. Many Christian arts can been seen in the church and their representatives are portraits of God and Mary called icons. You will find a luxurious and massive Christian art at the cathedral. Compared to the Japanese translations of the original language, common words in Catholicism and Protestantism are often used as different Japanese translations in Eastern Orthodox Church. Jesus Christ is translated as Iisusu Haritorisu in Japanese. The Virgin Mary is called as Douteijo Mary in Japanese. 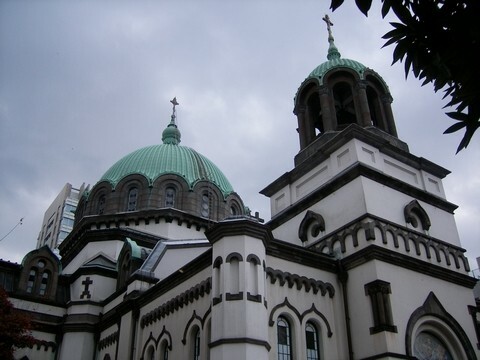 The Orthodox Church in Japan does not have so much believers, compared to Catholic and Protestant. But based on Holy Resurrection Cathedral in Tokyo, the number of churches all over the country is 20 in the diocese of the archbishop of Tokyo, 32 in the diocese of the bishop in East Japan, and 15 in the diocese of the bishop in West Japan. There are many believers nationwide.